Mary Bloom's Magical Table 6: DWAA 2015 Winners All! You are at:Home»Blog Posts»Mary Bloom’s Magical Table 6: DWAA 2015 Winners All! Mary Bloom’s Magical Table 6: DWAA 2015 Winners All! 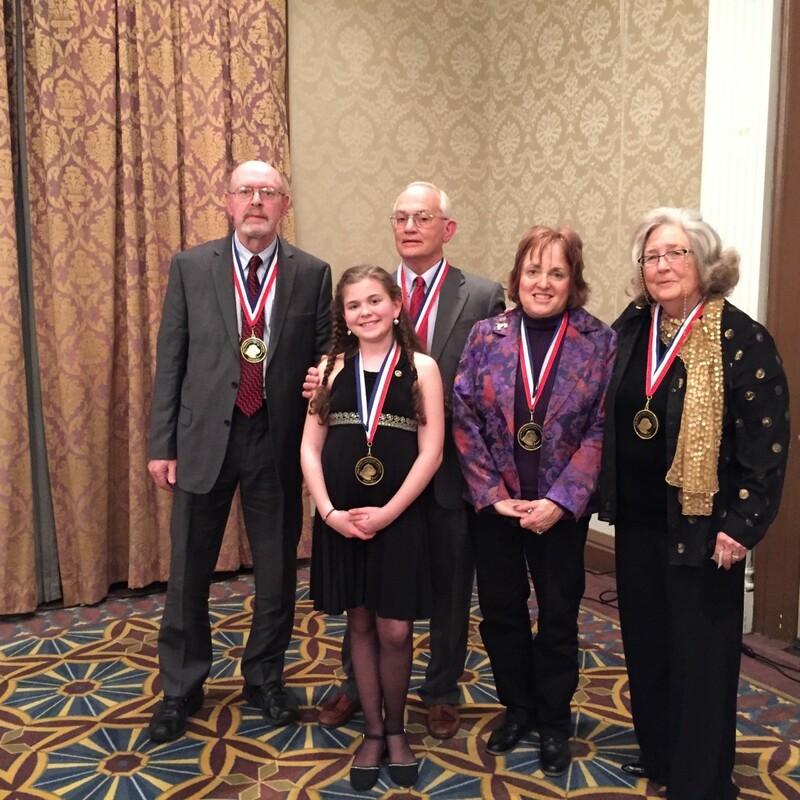 Last night I attended the 15th Dog Writers of Association of America Awards Banquet & Dinner at the Pennsylvania hotel in NYC, my traditional evening start of Westminster Kennel Club Dog Show activities of late. This year I had started earlier with the Westminster prepress media event on Thursday and a full day Saturday with the AKC Meet the Breeds and WKC Agility Championships. As I headed out in the frigid NYC weather, I was looking forward to spending a somewhat quieter evening with our guest interview Ranny Green and looking forward to a chance to meet his special guests from Newtown, CT, Samantha “Sammy” Kuruc and her mom Jill Kuruc. I had been sitting with Ranny last year when he won his last Maxwell Medallion for his story about Sammy and her special bond with a dog named Spartacus. In his acceptance speech, with tears streaming down his face, he had promised to give the award to Sammy. True to his word, he had not only given the award to Sammy, but she was with him tonight to cheer him on for the follow-up story he had written. By the time my cabby navigated the unusually busy city streets I found Ranny and his guests at Mary Bloom’s Table 6 with a full table – a wonderful group of Maxwell Medallion hopefuls. Mary Bloom is not only the official photographer for the DWAA dinner but also the Westminster Kennel Club. She is a two-time winner of the DWAA Distinquished Service Award and in 2014 was inducted into the the DWAA Hall of Fame for her lifetime achievement in photography specializing in dogs. What I had thought to be a quiet night turned into a winner’s delight – all my table mates who entered won Maxwell Medallions. The winner’s run began with longtime Long Island newspaper columnist and writer Joanne Anderson’s bagging the Maxwell Medallion for Category 2. Article/Column on Behavior and Training for her Amityville Record article, “Cancer Detecting in Dogs.” Next up, esteemed dog photographer, illustrator and designer Chet Jezierski captured his Maxwell Medallion for Category 24. Series Photos, “Wired” for Dog News. Then Sammy Kuruc held her breath and clutched her Maxwell Medallion for good luck while Ranny Green’s name was announced as a nominee for Category 18. Article – Health and General Care, “In Jackson’s Case” for the Seattle Kennel Club web site – then jumped for joy as he won. She happily accompanied him to the podium as he once more graciously accepted yet another Maxwell Medallion. Finally, it was time for the last Category 48. Any Other Topic. Kate J. Kuligowski, a longtime rescue activist and retired teacher’s book, “Our Most Treathe last attendee from a first timer to the DWAA awards dinner but a rescue activist of 60 years brought it home by winning the Maxwell Medallion. Kuligowski came back to the table with tears in her eyes. Her family has been rescuing dogs in New Mexico since the 1800s. All in all a fitting end to the evening. From Joanne to Chet to Ranny to Kate congratulations table mates, and a big congratulations to all Maxwell Medallions winners, Award winners and Nominees. For a complete list of winners, go here. What a wonderful night filled with special memories. There are no words to share about how special Ranny is to us and how he has impacted Samantha’s life. What an impressive and kind group of people we had the honor to meet. Congratulations to all of the outstanding writer’s and photographers whose work was recognized and who continue to share amazing stories about these wonderful animals/companions/healers/friends!